Yes, I realize that I am putting two spaghetti recipes back to back but I like pasta! What can I say?? I would eat it 4 or 5 times a week if I could and then you’d probably see me on the next season of The Biggest Loser. Ugh. Why does it have to have so many carbs?! So not fair…. My dad was visiting and we opted for a low-key meal at home on Saturday night instead of dealing with the rain (will it ever stop??) and crowds. I had found this recipe on Saveur.com and had sent it to him earlier in the week and suggested that we make this when he visited. And that’s exactly what we did! I adore artichokes. I will eat them prepared any way, any time of day. I think they’re so versatile and lend themselves to so many different preparation methods. I like them grilled, boiled, sautéed, baked, you name it–I’m there. What are your favorite ways to prepare artichokes? I’m always looking for new artichoke recipes! All in all, it was a nice evening and it was also nice to let someone else take over the cooking duties for the night! Sometimes it’s tiring always being the one who has to cook! Do you ever feel that way? Put some salted water on to boil for your pasta. 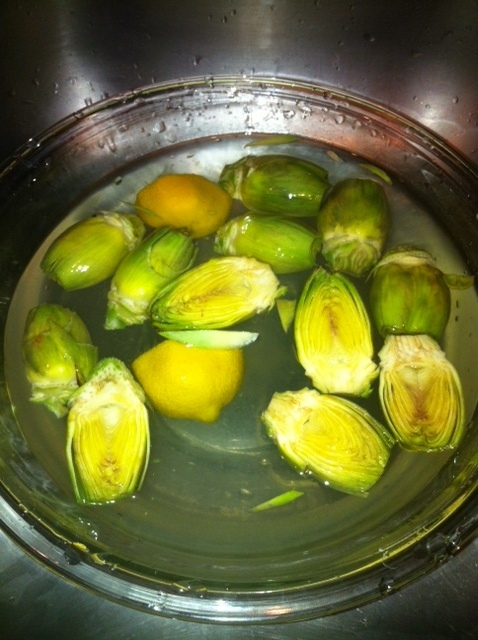 Also, put a smaller pot on to boil for the artichokes. 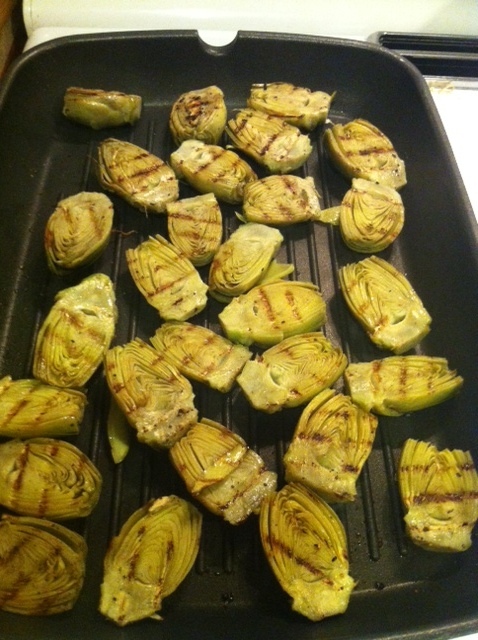 While you’re waiting for the water to boil, prepare your artichokes. Make sure you put them in a bowl with lots of lemon and water so that they don’t turn brown. If you don’t know how to prepare baby artichokes, check out this link which has a step-by-step slideshow. Easy! Boil your artichokes for about 5 minutes, you want them to still have a crunch to them. In a pan, heat up some olive oil over medium heat. Sautee your garlic, lemon zest, and red pepper flakes. Before you dump the pasta, make sure you reserve about a cup of the pasta water. Once your garlic is cooked (not brown!) 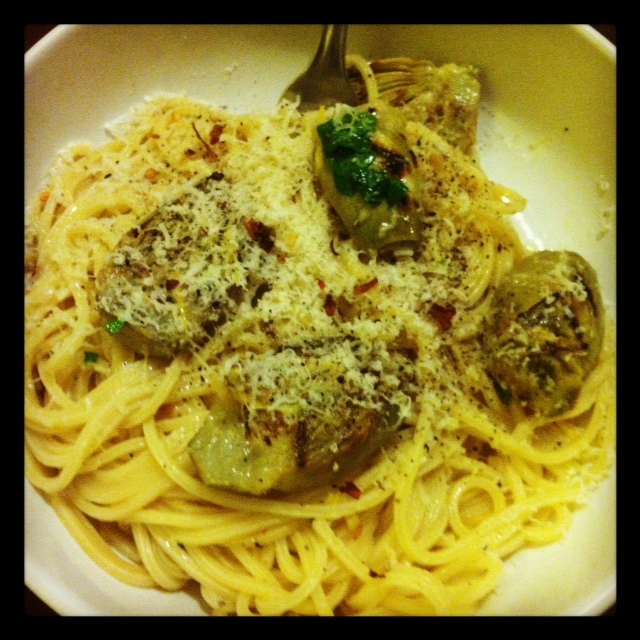 combine everything the pasta with the garlic mixture, some lemon juice, the artichokes, and some parmesan cheese. Add some of the reserved pasta water if it’s too dry to create a more smooth sauce. Garnish with more parmesan (why not, right?) and the parsley. This looks soooo good & I only had soup for lunch…I really need to try this! 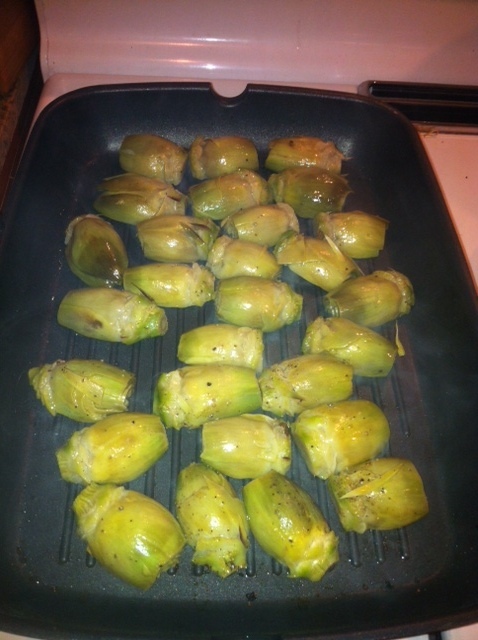 Baby artichokes are great just halved and sauteed til a bit crisp in olive oil/garlic and sprinkled with lemon juice…..yum! Boiled and eaten (hot or cold) with a bit of lemony homemade mayonaisse (superior to the jarred stuff) is also great. As far as I know, Publix is the only store around here that carries baby artichokes. Being that they’re immature, they don’t have a choke, and can be easily trimmed, cooked and eaten whole. delish and I love that you and your father cook together, makes it more yummy. 🙂 Thanks…yeah, we’ve cooked together for years now. When I was young it was more something he would force me to do, but now I enjoy cooking with him. If he wouldn’t have forced me to cook with him when I was young then I wouldn’t have learned all this stuff!